In archaeology, a method of dating by measuring the rate of release of luminous energy from an object; often used to establish the date when a pottery artifact was last heated in antiquity: Dr. Spicer used the process of thermoluminescent dating to determine the approximate age of the ancient pottery shards, or pieces, which he brought back from his archeological diggings. 1. A method of measuring the ionizing emissions to which a person is exposed by means of a device that contains a radiant sensitive crystalline material: Thermoluminescent dosimetry stores the radiation's energy by changing the structure and then when the material is heated at some later time, it releases the energy as ultraviolet or visible light. Because of her work in the X-ray department at the hospital, Ms. Smith frequently used the thermoluminescent dosimetry device to ensure that she remained uncontaminated by the radioactive emissions. 2. The determination of the amount of lucidity to which a material has been exposed: Usually thermoluminescent dosimetry is accomplished by heating the material in a specially designed instrument which relates the amount of luminescence coming from the material to the amount of exposure. Ionizing radiation; such as, x rays, alpha rays, beta rays, and gamma rays, remains undetectable by the senses, and the damage it causes to the body is cumulative, depending on the total dosage of thermoluminescent dosimetry received. Dr. Jonas used the thermoluminescent dosimetry concept to obtain an estimation of the amount of radioactive elements to which the X-ray staff might have received. 1. Increasing sluggishness or not alert and showing very little energy or vitality: "Sam always feels a great state of torpescence during the summer as opposed to a sense of vitality during the winter." 2. Growing numbness or inactivity and moving slowly in a very lethargic way: "Eve was overcome with torpescence during the hot and humid weather." A reference to becoming numb or being deprived of the power of movement or feeling: "Summer heat and humidity bring out the most torpescent side of the nature of many people." 1. Sparkling or shining results that are produced by friction; usually, within a crystalline substance: Microtechnology is able to detect the triboluminescence that is emitted when crystals, or sugar, are crushed, producing sparks of radiance. 2. The luster or emission of brightness that results from perfrication, scratching or mechanical pressure: Timmy and Sally were excited when they watched the bright flashes, or triboluminescences, that were visible when a piece of wool was rubbed on their cat's fur. Referring to the glittering or flickering results that take place when rasping, scraping or mechanical pressure is applied: As a science experiment, Jane and the other students compared the results of crushing glass, rhinestones, and common quartz to determine which triboluminescent element was the brightest. The production of light by friction or light that has been produced with friction. Shining results that take place when something is exposed to a high temperature that is produced in a material as a result of rubbing: When specific crystals are ground, they generate heat and so there appears to be a detectable tribothermoluminescence which can be measured by special instruments that are sensitive to detections of glittering sparks. A reference to brightly candent elements coming from exposure to high temperatures that are produced in a material as a result of grinding, filing, fretting, etc. : The research assistants, Mr. Anderson and Mrs. Smith, were interested in determining the tribothermoluminescent differences between various crystals when they were ground up and produced heat and detectable light. Conveying that which is swollen or showing signs of swelling; usually, as a result of a buildup of blood or water within body tissues: "Tumescent and tumor are related. Both go back to the Latin tumere meaning to swell. A tumor is literally 'a swelling'." A reference to becoming green or partly green: "The newly-budded leaves produced a light virescent result because of the warmer weather coming after the cold winter." Green or the quality of being slightly greenish. 1. Descriptive of something that is greenish or slightly green. 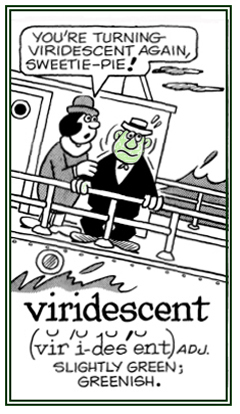 Sometimes people show viridescent colors in their faces when they get seasick or airsick. 2. Etymology: from Late Latin viridescere, "to grow green"; from Latin viridis, "green". © ALL rights are reserved. 1. The condition of becoming virile, specifically of assuming physical characteristics of a male. 2. A condition of some animals, and especially of some fowls, in which the female, when old, assumes some of the characteristics of the male of the species.